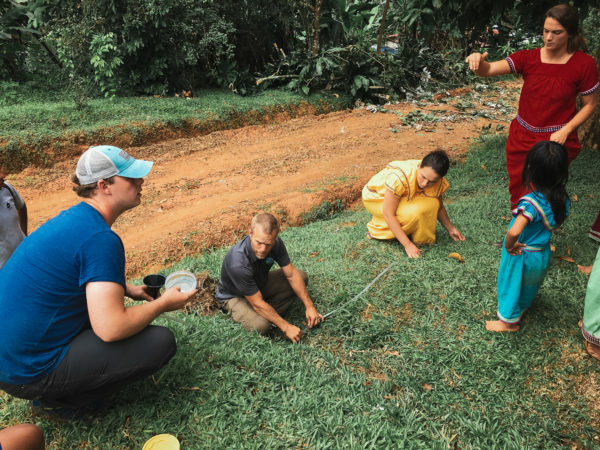 Renee McMinn, a civil engineering student and president of WSU’s chapter of Engineers Without Borders, realized the importance of the student club’s work one day last summer as she slid down a wet, grassy hillside with a group of children in rural Panama. Engineers Without Borders is partnering with the rural village of Zapote, Panama to bring clean water to its thousand residents. The village, located in the Ngabe-Bulge Comarca of Panama, does not have access to a reliable water source four months out of the year, and over 80 percent of the homes in the village lack running water. Water supplies have been decreasing since 2010, and without reliable water and good sanitation, people in the village are more susceptible to the spread of diseases. Over the summer, six students in the club traveled to Panama with Karl Olsen, club advisor and clinical associate professor in the Department of Civil and Environmental Engineering, on an assessment trip. The group hopes to go on a second trip later this year to implement their plan to bring clean water to the village. Being part of this club means making a difference and improving the lives for people in remote communities. The students are working to develop a clean water system for the village’s residents. The proposed project includes a system of pipes and a pump to deliver water from a nearby well to village homes. They are also helping to better map roads, homes, and water lines in the area. Lack of data in the area has hindered the region’s development and growth. The team has been working with WSU alumna Destry Seiler, who was stationed in the village, serving with the Peace Corps. She first approached WSU with the opportunity to do the project. The WSU students have completed the survey portion of the Panama project, and their work is already having a profound impact. At an event held in earlier this year, Gallardo award Olsen a certificate of partnership between EWB and the Comarca and committed to five years of partnership. Olsen is optimistic that the commitment and partnership will lead to success. Support WSU’s student chapter of Engineers Without Borders by donating online. Learn more about all the 30+ student clubs and professional organizations at WSU’s Voiland College of Engineering and Architecture.